Hi friends! 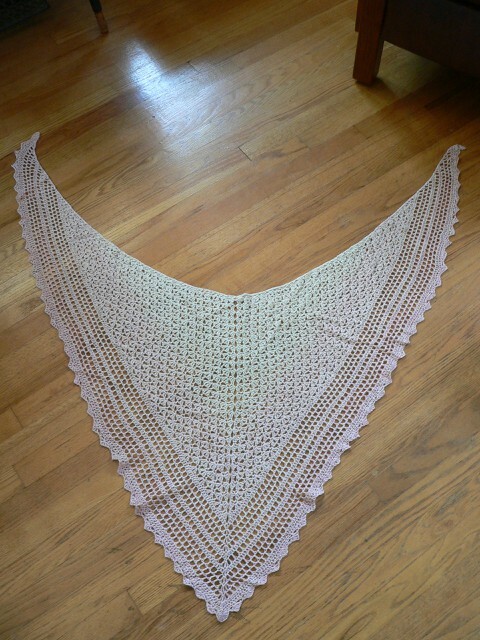 I finished up Lily of the Valley by Blackbird Designs. This is a pattern I borrowed from our friend Catherine. Catherine changed a few colors on her piece and inspired me to do likewise. I made mine more pink. Shocking, I know! 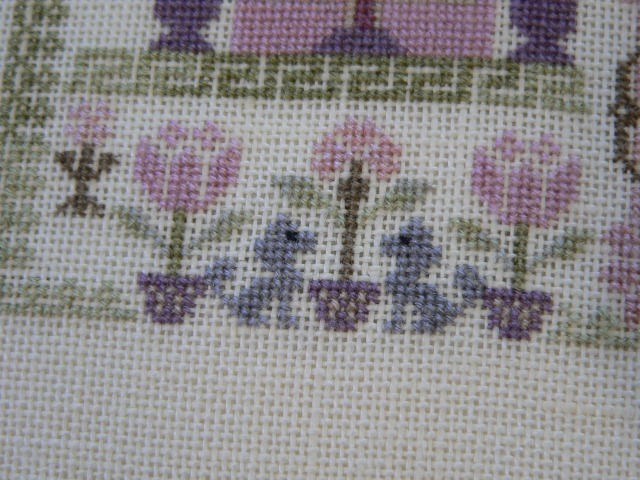 The pattern calls for WDW floss and I only used one of those that was called for!! Caper. I used VMSS flosses and DMC for the remainder. This is the fabric I backed this pillow with. Do not even ask me about the trim. I am so disappointed with how I sewed it in. ugh. I sewed it in Wednesday night during a HUGE thunderstorm. There were tornado sirens going off. My headache went up with the pressure system I guess. There is no other explanation truly. I did not even go outside that day, and it was not hot either. So I don't think I was thinking clearly through the pain. All I know is I turned the pillow inside out and my corners are all tight and curved?And I am not redoing it! 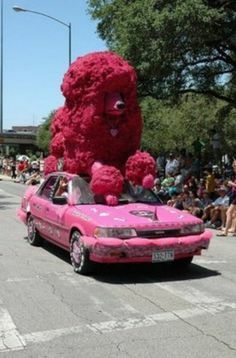 I was going for this look I did years ago. I won a giveaway from our friend Minnie. 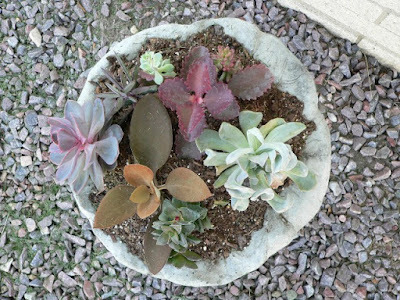 Isn't this a sweet pattern? Thank you again Minnie! The latest book I read while walking the treadmill was The Photo Album by Marlene Chase. 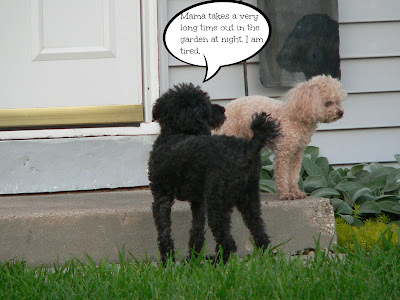 This is the third book in Annie's Attic Mysteries, a kind of cozy mystery series. Annie knits and crochets. 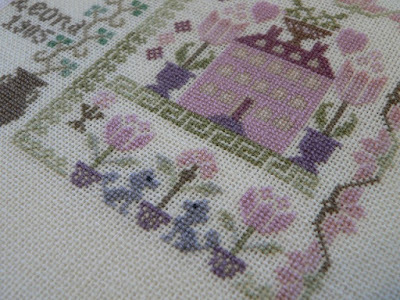 Her best friend Alice cross stitches. If you like simple mysteries, in a small town atmosphere kind of books, this series is for you. "No one seems to recognize the young man caught in the background of some old photos that Annie found in the attic of Grey Gables. But Mary Beth, owner of A Stitch in Time, turns strangely pale when Annie shows the photos at the Hook and Needle Club meeting. 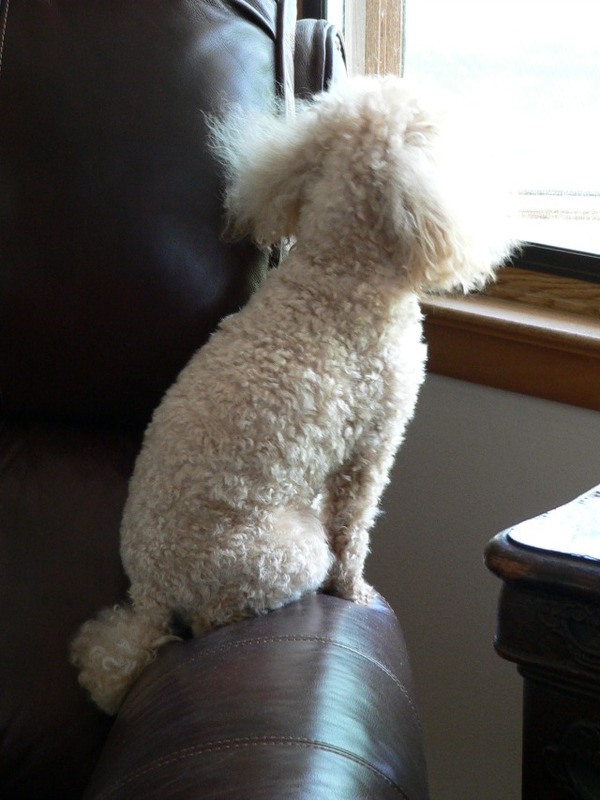 Annie is determined to find out who this stranger is and what became of him. His young, sad face haunts her and she feels compelled to unearth his story. 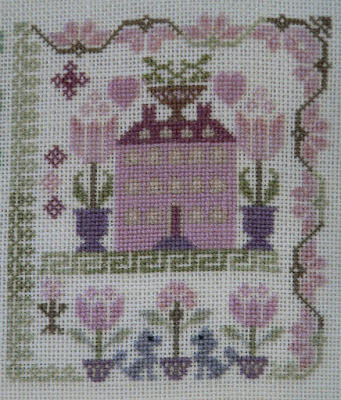 Then disturbing information gleaned from old newspapers and a seemingly unrelated hit-and-run accident injuring her handyman's daughter, Emily, seem to bring danger closer and closer to Annie as she pursues the truth about the young man in the photos"
Here is somebunny I watch out the kitchen window as I stitch. One of the bunnies born this spring. He is getting big now. 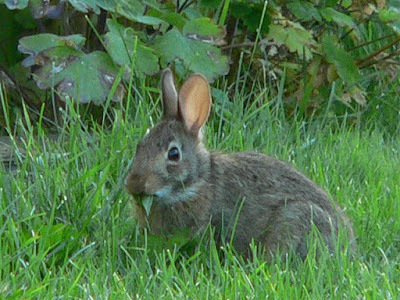 He is munching a dandelion leaf here. Good for you Bugs!! 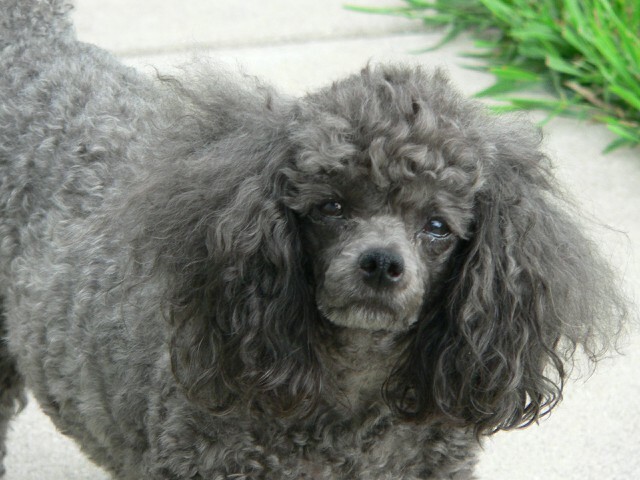 (Yes, Brian named him Bugs Bunny ;) Since I can't get out to weed as much, I can use the help. HA! Hi friends! I finished Farm House this week. 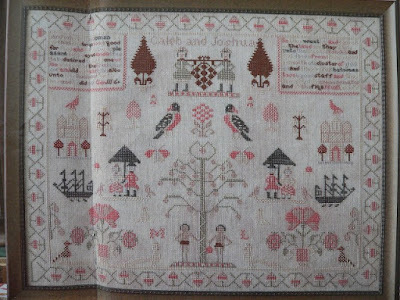 What a pretty sampler this is. 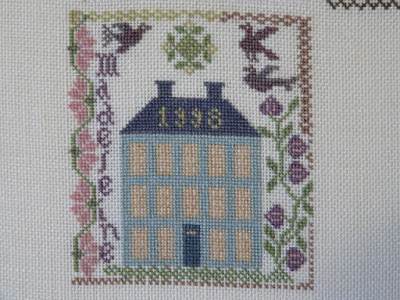 It is Madeleine's sampler. I made many color changes. 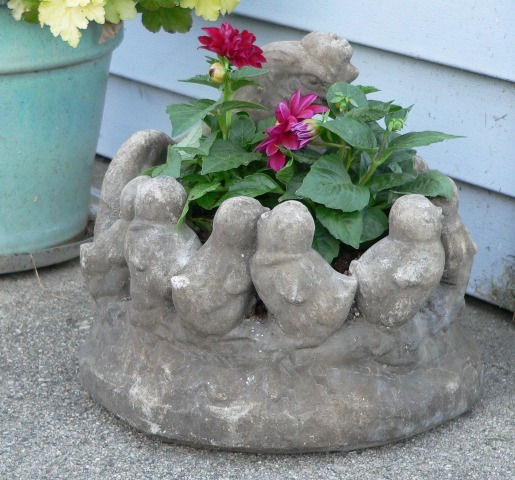 I used DMC and VMSS I used VMSS Antique Var Lilacs for the birds and VMSS 1795 Faded Celery instead of DMC 833. The purple suggested in DMC, 553, for the flowers was replaced with 3041 because it was nowhere near the cover picture. 543 was replaced with Ecru so it showed up on my linen. The front door to the house has almost a bluish color to it. I replaced 3799, a solid grey with 3768. 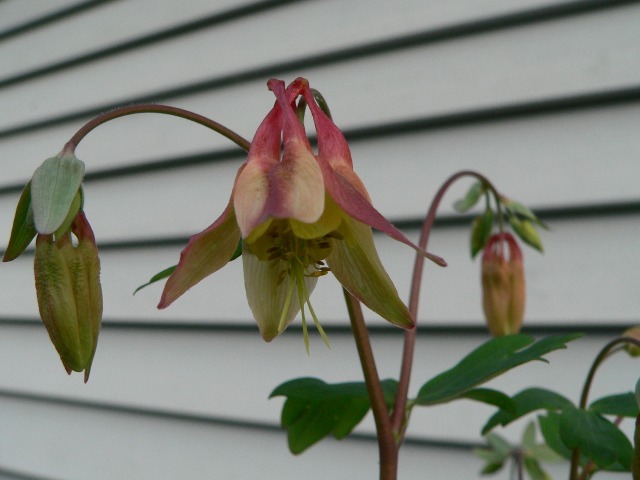 It compliments the house color nicely now! The roof color suggested, 3787, was so wrong, I replaced it with 317. Finally, I stitched the windowsills up in 738. 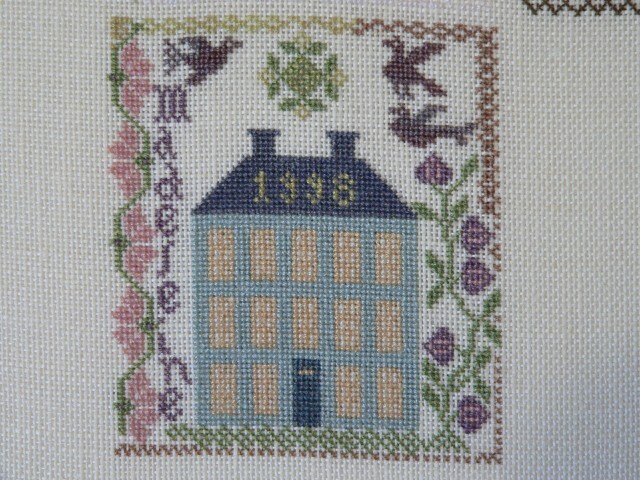 As you can see, Madeleine has quite a long name, so I had to take out a few motifs and one bird. 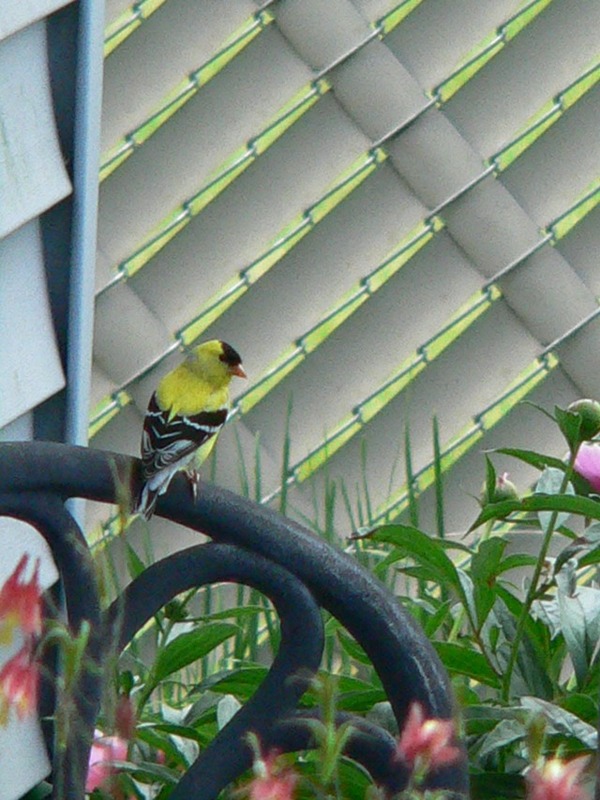 I also moved that remaining bird on the left up one. I once again left off some of the small diamond motifs. 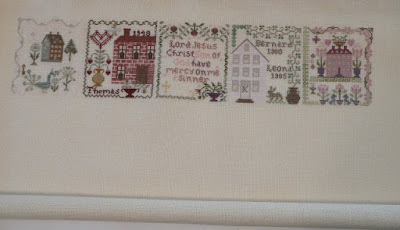 I like the simplicity of the sampler better this way when it is stitched one over one. 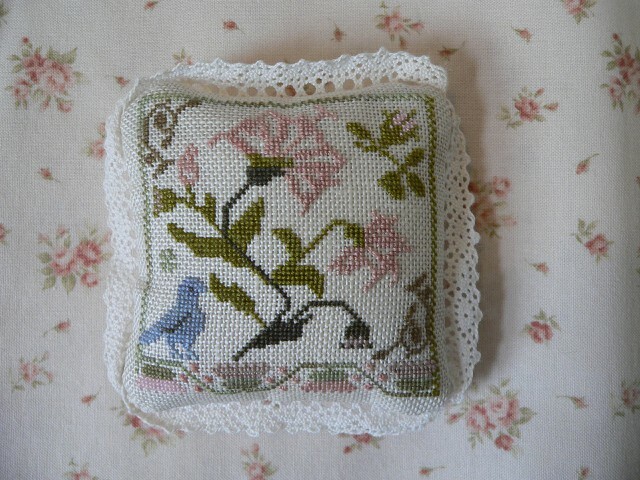 I am now stitching up BBD The Lily of the Valley. 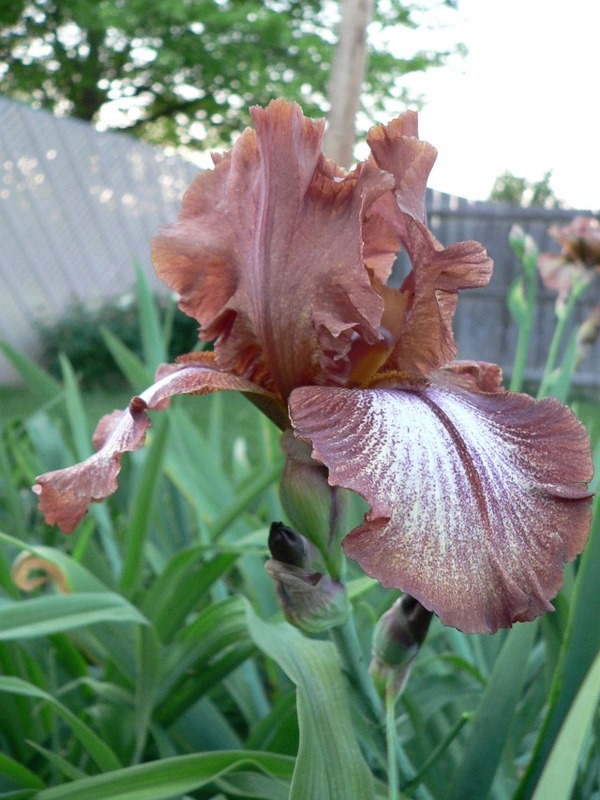 This is a class project from a BBD retreat that our friend Catherine has borrowed me. Thanks again Catherine! 😊 It is such a pretty piece. It does not give the DMC conversions, so I had to look those up. I only had two of the WDW flosses. It took me ages to settle on flosses and linen. 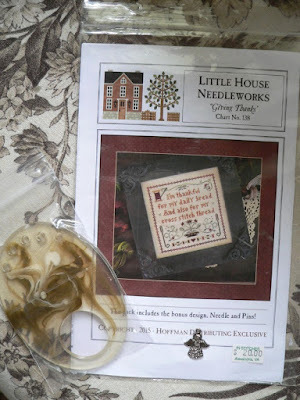 Only to discover my perfect linen choice was 28ct not the called for 32ct. I just decided to stitch it one over one on the 28ct. Imagine that, huh?! 😉 I know. I know. So many of you do NOT prefer one over one, but I DO. What can I say? Right Carol? I just finished an audio book, Songs of Willow Frost and what a good one it was! This was a new author to me. His name is Jamie Ford. This book intrigued me with the main character, a little Chinese boy who is an orphan in a Catholic orphanage. It was just so different than anything else I had read,so I wanted to read it. And it was different. I am glad I read it. It was good and interesting and I learned too. 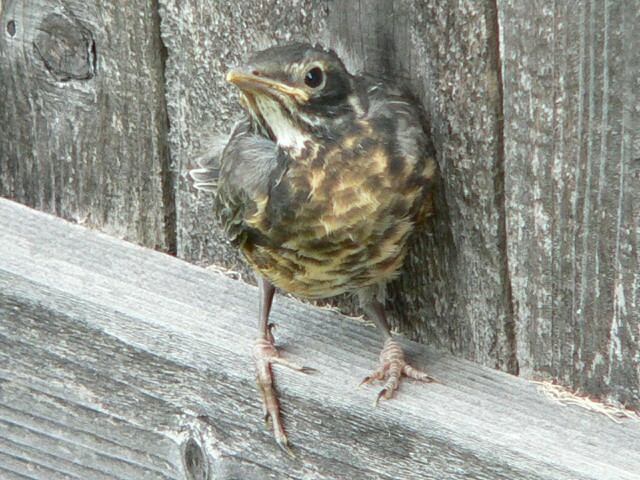 On Tuesday all three of the baby robins left the nest. How fun to watch Mom and Dad Robin teach the little ones how to live out in the big world. Thank you for your kind words my friends. I hope you have a great weekend! Thanks for stopping by. Hi friends! 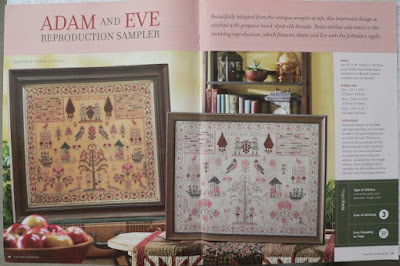 I want to announce the winner of my giveaway for the Adam and Eve Reproduction Sampler chart by Robin Laukhuf . Mendy Elliott! I have no way of contacting you Mendy. Please email me with your postal address. The last audio book I just listened to was The Women in the Castle by Jessica Shattuck. This book was recommended by our friend Carol. Oh wow. I truly liked this book. I have never read (or listened) to a book about what life was like during and after WW II for women. This is a fiction book. My only complaint is the occasional swearing. I hope you have a stitchtastic week my friends! I am so glad you stopped by. Hi friends! 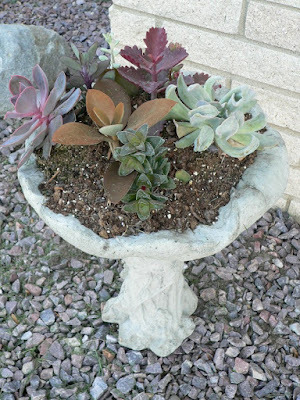 I want to share with you a most special gift I received several days ago from our friend Barbara. This was a total surprise gift, and surprise me is what she did indeed. Actually I was very honestly stunned. I stood in awe when I opened the pink tissue paper, that Barbara had crocheted this prayer shawl for ME?!? My pictures do NOT do show the beauty of this shawl. 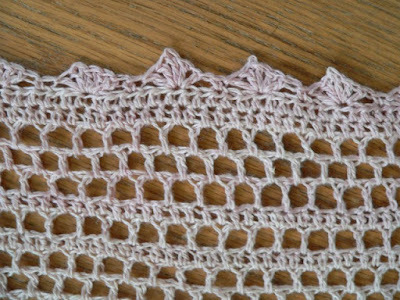 Barbara used a lovely silk/linen gradient yarn of cream to light pink. Ooooh friends! It is just so lovely to wear. When I put it on I feel the love. I truly, truly do. Go HERE to see Barbara's better pictures of the prayer shawl she made and gave me.❤️ Thank you once again Barbara! Here is the progress I have made on Farm House. The latest book I finished reading while treadmill walking was A Bridge Across the Ocean by Susan Meissner. ooOoo! I really liked this book! Have you ever read books about War Brides? This book is about that. Oh how very, very interesting. Wartime intrigue spans the lives of three women—past and present—in the latest novel from the acclaimed author of Secrets of a Charmed Life. I have a giveaway going on right now. 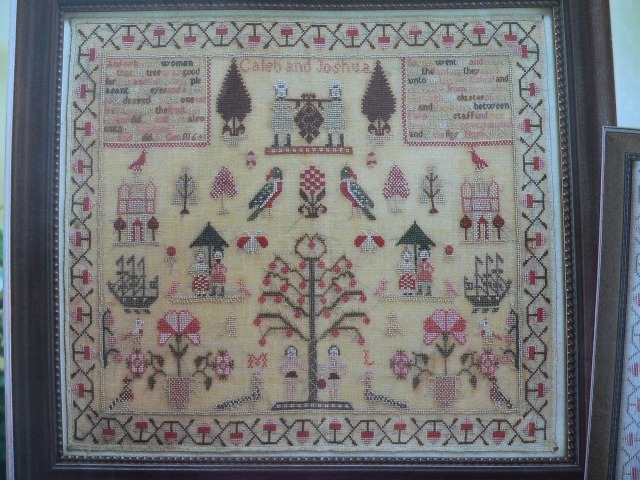 It is for an Adam and Eve Reproduction Sampler. 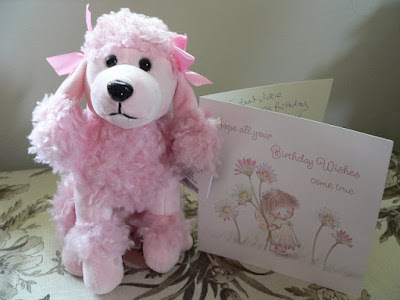 You can enter the giveaway HERE. If your Dad is still living I hope you are able to be with him for Father's Day this Sunday. I am going to stop by my Dad's grave with some flowers. Thank you for your words of encouragement! I am so blessed to have friends like YOU! Have a wonderful weekend! Hi friends! What a windy, hot, hot weekend. In the 90's. I stayed inside to avoid making my headaches explode. 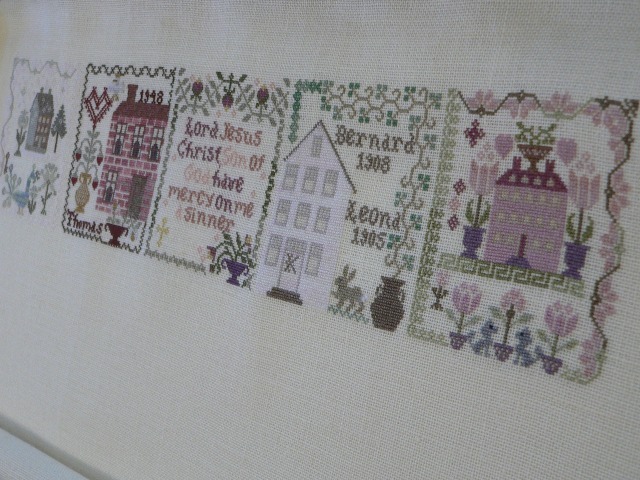 I finally worked out the personalization for every single sampler block in this AotH series. So I went back to the very first one stitched. Snow Garden. It was never personalized. 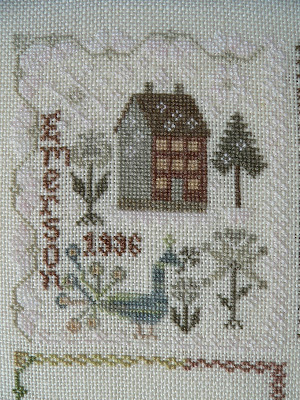 It has now become Emerson's sampler. There was a key motif where the "s" and "o" of his name are. I had to unstitch that. 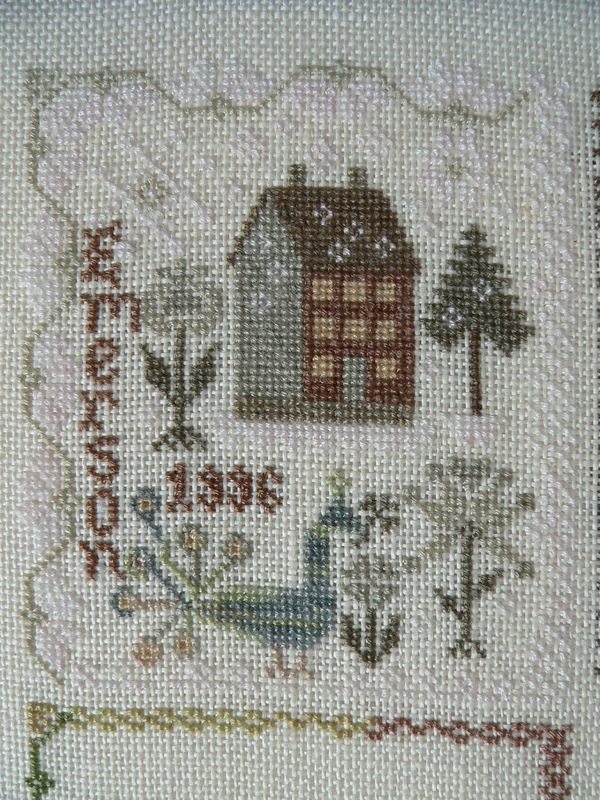 I also had to unstitch the eyelet part of the peacock's feather by the "n". And shorten the overall length of the feather by just a bit. Then restitch it all. I think it worked out very well. 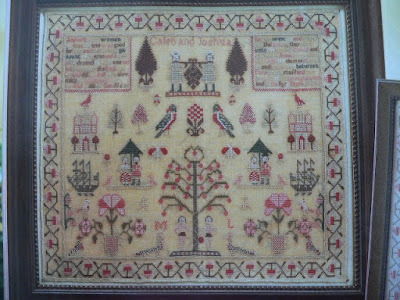 It is a bit trickier adding the names and dates since I am stitching all over one instead of how it is charted as over two with the personalizations in over one. I have begun the border on Farm House. 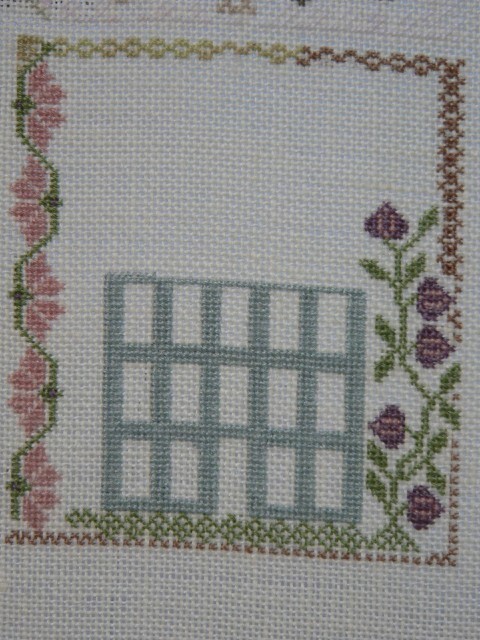 That is the first pattern in the second row. You can see part of it showing in the above picture. Look what came in the mail for me for my birthday all the way from England! I finished listening to The Red Bandanna: A Life, A Choice, A Legacy by Tom Rinaldi last week. Wow, that was good. I thought I was prepared to go back to September 11th again. I guess not completely. One Sunday morning before church, when Welles Crowther was a young boy, his father gave him a red handkerchief for his back pocket. Welles kept it with him that day, and just about every day to come; it became a fixture and his signature. A standout athlete growing up in Upper Nyack, NY, Welles was also a volunteer at the local fire department, along with his father. He cherished the necessity and the camaraderie, the meaning of the role. Fresh from college, he took a Wall Street job on the 104th floor of the South Tower of the World Trade Center, but the dream of becoming a firefighter with the FDNY remained. When the Twin Towers fell, Welles’s parents had no idea what happened to him. In the unbearable days that followed, they came to accept that he would never come home. But the mystery of his final hours persisted. Eight months after the attacks, however, Welles’s mother read a news account from several survivors, badly hurt on the 78th floor of the South Tower, who said they and others had been led to safety by a stranger, carrying a woman on his back, down nearly twenty flights of stairs. After leading them down, the young man turned around. “I’m going back up,” was all he said. The survivors didn’t know his name, but despite the smoke and panic, one of them remembered a single detail clearly: the man was wearing a red bandanna. Tom Rinaldi’s The Red Bandanna is about a fearless choice, about a crucible of terror and the indomitable spirit to answer it. 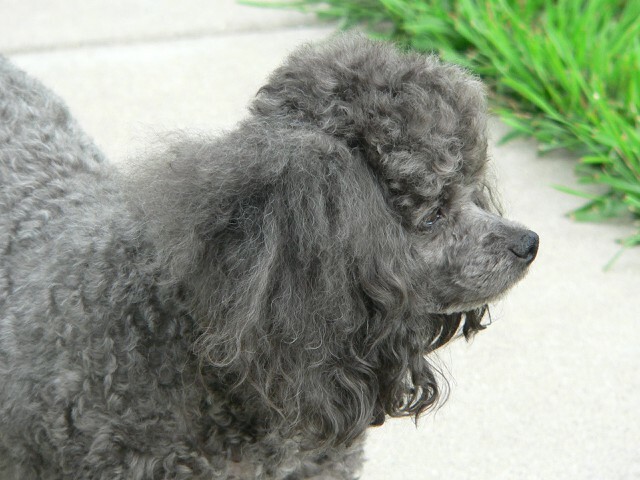 Examining one decision in the gravest situation, it celebrates the difference one life can make. We have a family of Robins living in the espaliered apple tree in our back yard. This is a picture from the day they were hatched. It is going to be hot all week. I guess I will be stitching all week. I hope you have a great week my friends! Thanks for stopping by with your nice comments. 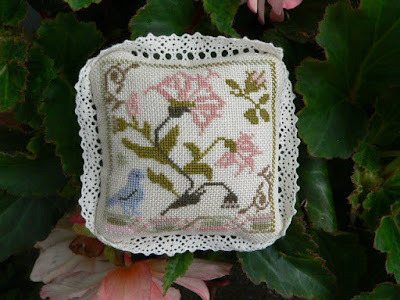 This entire sampler block is stitched one over one on 25 count cream Dublin linen using DMC. I made substitutions of alternate DMC colors to my liking as I stitched. As you can see my Manor is a bit different. I like the two sweet doves charted at the bottom very much, but I could not resist adding two poodles. I had to heighten that central flower on the bottom to accommodate the poodles. 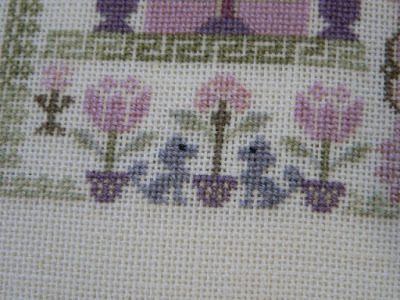 I left off some of the tiny motifs that were charted since this is all stitched one over one on 25 count linen, it really does not need extra "stuff". I hope you have a wonderful weekend my friends. It is going to be near 100º here this weekend, so I am going to be inside stitching. 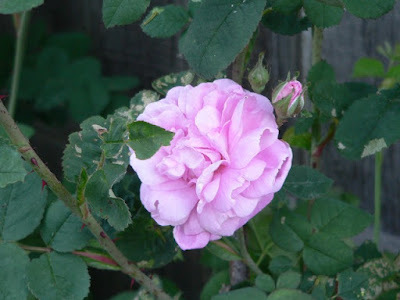 I have been gardening in the evenings this week though after the sun goes down. Hi friends! How was your weekend? Mine was great! 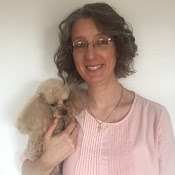 I had chocolate birthday cake AND strawberry cheesecake yesterday at my mom's.🎂 😊Tomorrow I turn 48! I would like to offer this large Adam and Eve Reproduction Sampler chart by Robin Laukhuf as a giveaway for all of my follower friends. This is a chart that is ripped out of an old Cross Stitch and Needlework magazine. I will be folding the four pages so they fit into a business size envelope to save on postage. You must be a follower of mine and you must leave a comment on this post telling me you want to be entered into the giveaway. This giveaway is open to any one of my followers anywhere. I will draw the name of the winner on June 19th. Agent M: The Lives and Spies of M15's Maxwell Knight by Henry Hemming is the book I finished last week. It was not what I expected. While I found his life story interesting, I was hoping for more stories of the spies and their missions. I am not going to lie. I ended up skimming a lot of the information after I got halfway through reading the book. Maxwell Knight was a paradox. A jazz obsessive and nature enthusiast (he is the author of the definitive work on how to look after a gorilla), he is seen today as one of MI5's greatest spymasters, a man who did more than any other to break up British fascism during the Second World War -- in spite of having once belonged to the British Fascisti himself. He was known to his agents and colleagues simply as M, and is rumored to be the inspiration for the character in the James Bond series. Agent M is about more than just one man however. In its pages, Hemming will reveal for the first time in print the names and stories of some of the men and women recruited by Knight, on behalf of MI5, and then asked to infiltrate the most dangerous political organizations in Britain at that time. Until now, their identities have been kept secret outside MI5. Drawn from every walk of life, they led double lives -- often at great personal cost -- in order to protect the country they loved. With the publication of this book, it will be possible at last to celebrate the lives of these courageous and selfless individuals. Drawing on declassified documents, private family archives, and original interviews, Agent M reveals not just the shadowy world of espionage but a brilliant, enigmatic man at its shadowy center. When ALL hormonal headaches have past and are out of me, my headaches go way down. 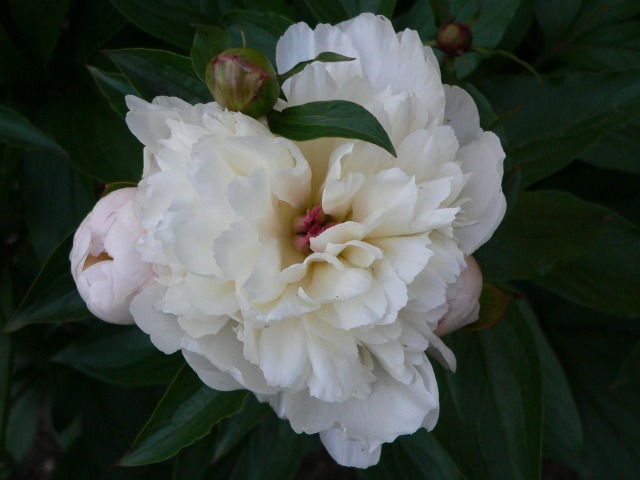 THEN on those days I am able to go out into the garden in the evenings. 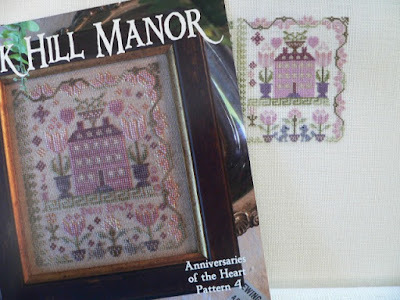 I will have an updated Pink Hill Manor picture for you next time. I am trying to finish it. I am sure I will since I will be inside this week. It is hot and sunny here lately, so I must hide inside to avoid headaches. Have a wonderful weekend my friends. Thank you for stopping by!